The CSA Cookbook was written not as a manifesto on food waste or food security, but as a celebration of the art of using the whole vegetable in your day-to-day cooking. I hope it will embolden you to look at food in a different way, be spontaneous in the kitchen, and feel inspired by your CSA box, farmers’ market basket, or backyard harvest. Linda Ly says her new cookbook is not a manifesto on food waste, and I don’t want this review to be, either. But I do want to begin with a few observations on the subject. There are a lot of reasons not to throw away perfectly good food: to save money, to keep discarded food from filling up our landfills, to get food to people who need it. Yet something like 40 percent of all food is trashed before it even gets to our tables. If Americans saved just 5% of that wasted food, four million more people could eat. I try to do my part to minimize food waste. I cook with things other people might throw away. I add broccoli stems to my stir fries; I throw tired-looking carrots and celery stalks into the stock pot. Much of what I don’t eat, I give to the chickens. The rest goes on the compost pile. When I heard The CSA Cookbook was available for pre-order, I went straight over to Amazon.com to put it on my wish list. I was intrigued by its promise of roots-to-leaf recipes that use all parts of the vegetable. And when my copy of the book arrived on my doorstep this spring, I was pleased to find that Ly – whether she intended to or not – has confronted the important topic of food waste in a practical, accessible, and beautiful way. 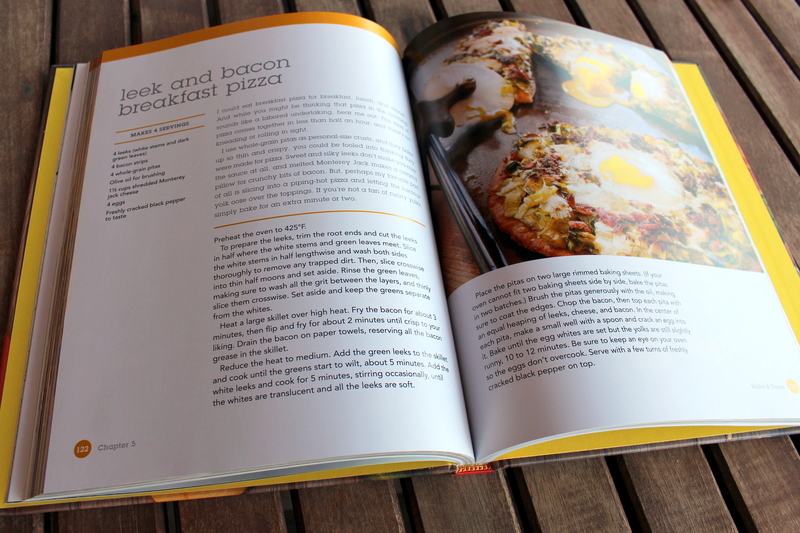 Leek and bacon breakfast pizza – OMG, I have to try this one soon! Don’t let the title fool you. Even if you aren’t a community supported agriculture (CSA) subscriber, you will benefit from The CSA Cookbook. Sure, if you belong to a CSA, you will learn all sorts of ways to use the more unusual vegetables that you receive in your weekly delivery. But if you are a home gardener, you stand to learn even more. The CSA Cookbook describes ways to use parts of the vegetable that never make it into a CSA box and usually end up in a gardener’s compost pile – like tomato vines, pepper leaves, and broccoli greens. Yes, all of these parts of the plant are edible, and Ly shows us ingenious ways to use them in cooking. Ly’s no-waste approach to cooking has its roots in the food culture of her Vietnamese heritage. She learned to cook from her parents, whose experiences in war-era Vietnam instilled an abiding sense of thrift. She started growing her own food in 2010, when she moved into a little house with a big backyard garden. It came naturally to her to find ways to use all parts of the vegetables she grew. 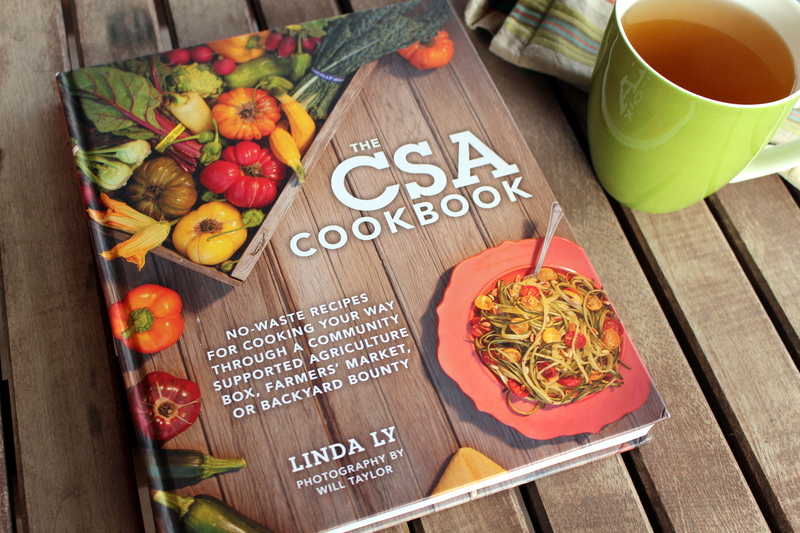 With The CSA Cookbook, Ly provides easy access to her creative, yet practical approach to cooking. Chapter one covers the basics: a list of pantry staples, a guide to storing produce, and basic recipes for stock and pesto. These recipes are genius – basically mix-and-match formulas with charts of ingredients. Just select whatever you have on hand from the different categories of ingredients and combine. Some of the ingredients are surprising (the everything-but-the-kitchen-sink stock chart reads like the contents of my compost bucket), but make perfect sense. Chapters two through eight run the garden gamut from tomatoes & peppers to roots & tubers to flowers & herbs. The recipes feature a combination of familiar vegetables used in new ways, little-known vegetables, and parts of the vegetable that typically are discarded. Did you ever think about cooking radishes? Or making pesto from bean leaves? I know I’m intrigued. Take kohlrabi, for example. A lot of people are unfamiliar with this bulb vegetable (a member of the brassica family and a relative of cabbage and broccoli). I grow it in my garden every year but only have eaten it raw – as a crudité with a little salt or in a slaw. I never even thought about cooking it, but one of the first ways I will be preparing it this year will be in kohlrabi home fries with thyme aioli. And instead of giving all of the kohlrabi leaves to the chickens like I usually do, I will make kohlrabi green and wild mushroom ragout with polenta at least once. Kohlrabi home fries – now, why didn’t I think of that? Also in the “why didn’t I think of that” category is using a broccoli leaf as a wrap, as Ly does in her broccoli green and baked falafel recipe. The CSA Cookbook has opened my eyes to all sorts of green wrap possibilities. Chard leaf bratwurst wraps anyone? Stayed tuned; I’m already thinking about how to put a Midwestern spin on this concept. Adding to their accessibility, most recipes call for only a handful of ingredients (in addition to the produce from your CSA box or garden basket), and almost all ingredients are pantry staples or found in the average grocery store. If you’re missing an ingredient, Ly provides tips on how to adapt the recipes to whatever is on hand. This easy approach to cooking allows flexibility and encourages experimentation. Even if you don’t have a garden or belong to a CSA, The CSA Cookbook will inspire you to look at vegetables – and all parts of the vegetable – in new ways. Think before throwing those carrot tops away. Pay a visit to your local farmers’ market and try something new. Plant something new. 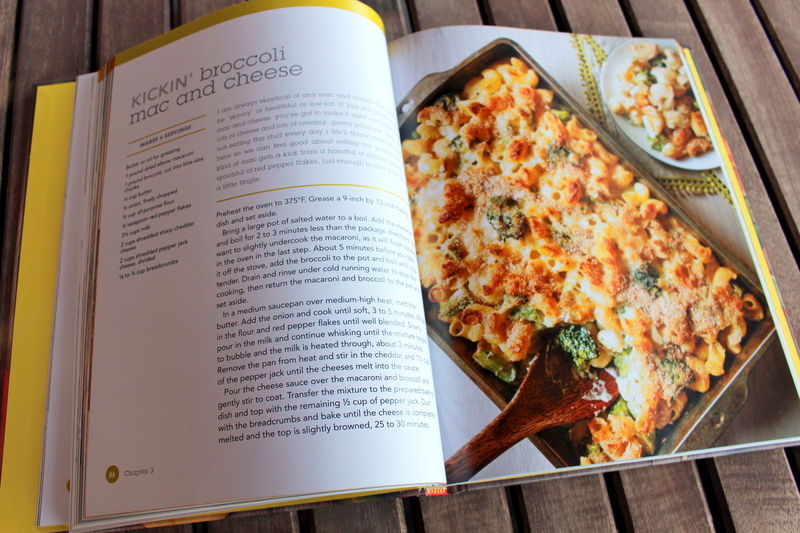 Kickin’ broccoli mac and cheese is sure to make it into my dinner rotation. It seemed appropriate to use produce from my own garden for my first foray into The CSA Cookbook. My selection is limited this time of year, but I do have some beautiful walking onions in the garden. Since scallions are listed in the “greens” category of the Chapter 1 pesto primer, I decided to harvest some of my walking onions to make scallion pesto. Following the mix-and-match pesto formula set out in Chapter 1, I used 2 cups packed scallions, 1/3 cup toasted walnuts, 1/2 cup grated Parmesan cheese, 3 cloves of garlic, and 1/3 cup olive oil, and combined everything in a food processor until smooth and creamy. I then went ahead and used some of the pesto to whip together a simple dressing inspired by the pesto vinaigrette recipe also found in Chapter 1: 1/4 cup scallion pesto, 2 T extra virgin olive oil, 1 T lemon-infused olive oil, 2 T white wine vinegar. The verdict: Scallion pesto is a great new condiment to have in my repertoire, but a little goes a long way! I used the pesto a few different ways. I put a dollop on top of grilled steak. The pesto combined well with the fats and juices of the meat and provided a bright, herbaceous bite. I also added a few spoonfuls of pesto into a simple pasta dish made with bow-ties, peas and cauliflower, and the result was delicious! 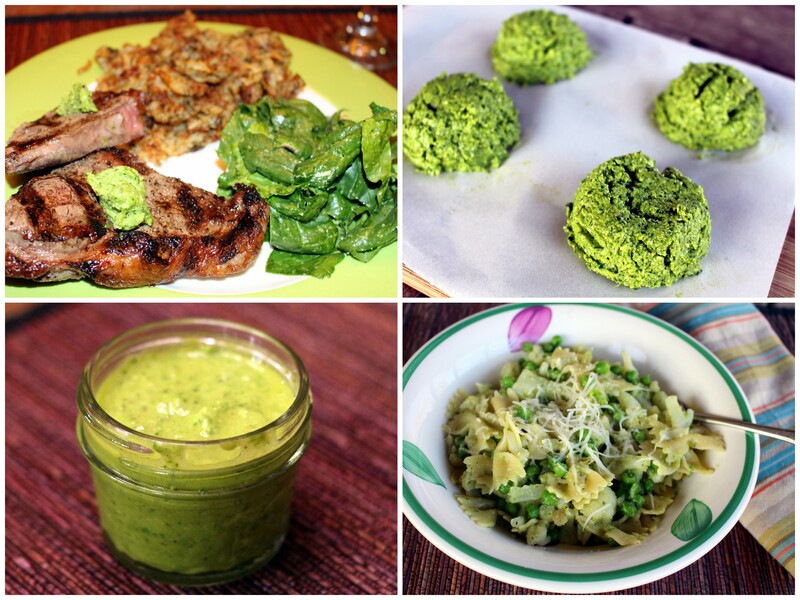 I had a lot of leftover pesto, so I froze the rest using Ly’s handy pesto freezing guide. My favorite use of the pesto was the vinaigrette. I used it to dress fresh spinach from the garden for a super simple, delicious salad. 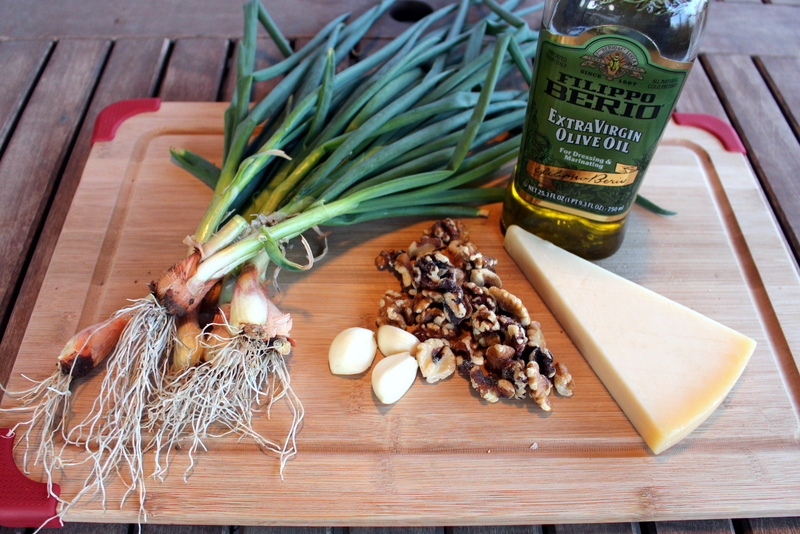 The vinaigrette also would hold up well as dressing for roasted vegetables or potato salad. Those will be some of my future experiments with my frozen leftovers. I definitely plan to revisit the pesto primer when there is more up in the garden so I can try different combinations of herbs and greens. With lots more recipes to explore and a garden full of produce, I have a feeling I will have a lot of fun with The CSA Cookbook this summer! Note: I received a copy of The CSA Cookbook in exchange for this review; however, all opinions expressed in the review are my own. I already had a copy of the book on order (thanks to a Christmas gift from my wonderful mother-in-law), and was planning to review it because it addresses a topic that is important to me. And now I have an extra copy to share with one of you! 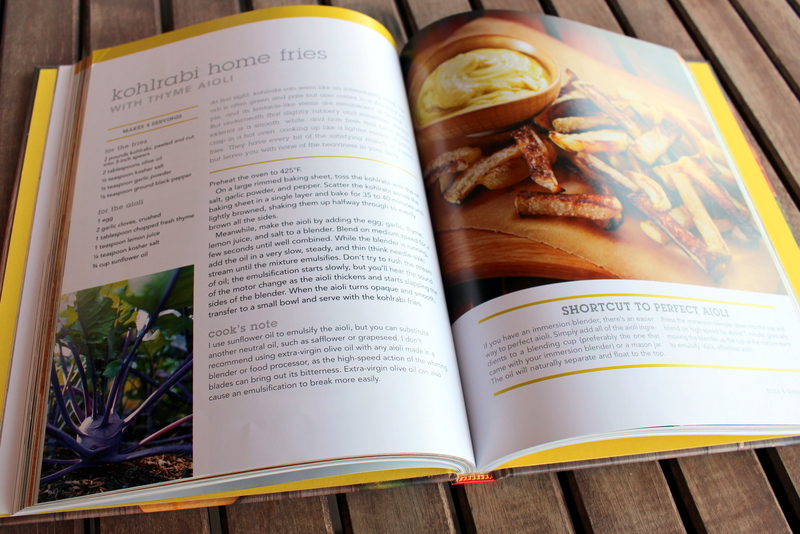 For a chance to win your own signed copy of The CSA Cookbook, enter below. Make sure to leave a comment on the post saying what new vegetable you would like to try. All entries must be received by 12:00 a.m., April 20. The winner will be selected at random and notified by email. Good luck! This entry was posted in Cooking with Garden Produce and tagged book review, csa cookbook, home cooking, recipe by Deborah Neyens. Bookmark the permalink.